Sen. Jeff Flake abruptly announced Tuesday he won't run for re-election after all in the 2018 midterm elections and will leave the Senate when his term ends in January 2019. He also delivered a blistering rebuke of President Trump's behavior. The Arizona Republican announced on the Senate floor that he could "better serve my country and conscience" by dropping his re-election bid, "freeing myself of the political consideration that consumed far too much bandwidth," he said. Flake issued a thinly-veiled take-down of President Trump, criticizing the "personal attacks," the "threats against principles, freedom and institutions" and "flagrant disregard for truth and decency." He argued that recklessness, outrageous and unhinged behavior have been excused as "telling it like it is, but he warned that when such behavior "emanates from the top of government," he said it's something else. 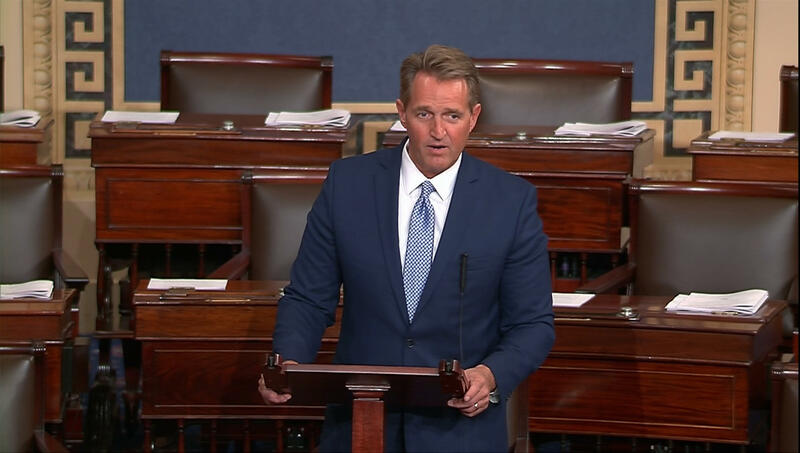 "It is clear at this moment that a traditional conservative...has a narrower and narrower path to nomination in the Republican party," Flake admitted on the Senate floor. Flake said that it is his obligation to be critical and not to be silent. "Silence can equal complicity," he said. "I will not be complicit or silent." Flake first revealed his decision in a phone interview with The Arizona Republic Tuesday: "Here's the bottom line: The path that I would have to travel to get the Republican nomination is a path I'm not willing to take, and that I can't in good conscience take." "It would require me to believe in positions I don't hold on such issues as trade and immigration and it would require me to condone behavior that I cannot condone." "There may not be a place for a Republican like me in the current Republican climate or the current Republican Party," Flake said. Flake, 54, had been expected to run for re-election, but has been especially critical of President Trump and the Republican Party over the last several months. The president attacked Flake on Twitter and his former White House chief strategist, Steve Bannon, has said he's backing Kelli Ward, who had launched a primary challenge to Flake. Ward said over the summer that Sen. John McCain, R-Arizona, should resign from his seat because of his brain cancer diagnosis. Flake has served in the Senate since 2013 and previously served in the House from 2003 until 2013. He was on the scene during the June 2017 GOP congressional baseball practice shooting that left Rep. Steve Scalise, R-Louisiana, wounded.